hightouchmegastore: On children and the past. I ran across this photo as I was trying to do a little straightening in my study. There it sat, atop a box atop another box, under my table, a stray little rectangle. Two of my children, my oldest and youngest sons, taking a nap after church. I remember when they were both younger, the oldest being such a kind older brother to the younger. Their closeness in this picture reminds me of that. That couch was a nap magnet, and the youngest boy, long and skinny but still small, could easily lay across the back cushions and fall asleep. I had them. I had them as infants and for the years they were children and then young men. And now, they are grown, and belong to themselves. A friend and I were talking recently about having children. Her little boy is just a year and a half. The years when they were small I have only in memory, which is flickering and incomplete. I am grateful for those little bits of the past, honestly. 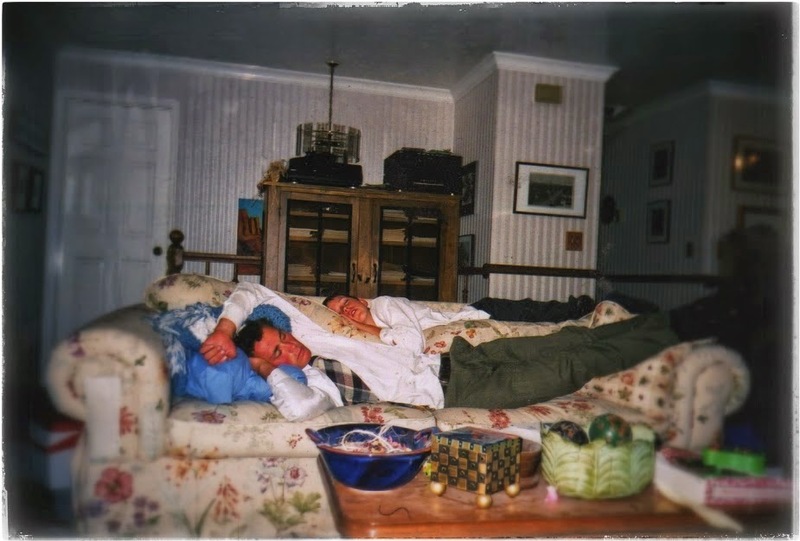 It's never over, either, but there are moments that are over, so I'm grateful for the surfacing of a photograph, which can remind me of long Sunday afternoons when I was thinking about what to make for dinner, when they fell into sleep and I could see them at rest, with their own dreams and with each other.